Philip Joseph Gagliano was born December 27, 1941 in Memphis, Tennessee. 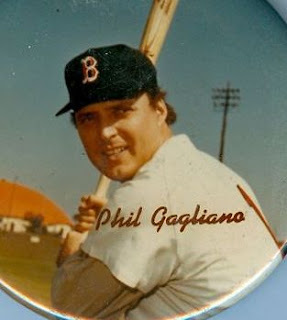 Phil’s brother Ralph Gagliano played in the minors throughout the sixties, playing one game in the majors with the Cleveland Indians in 1965. Phil was an all around infielder/ outfielder who had a 12 year career mostly as a utility player & pinch hitter. The six foot one right handed infielder, was signed out of high school by the St. Louis Cardinals in 1959. After five minor league seasons he made his debut in 1963. He spent seven seasons in St. Louis as a utility player seeing the most action in 1965. That year he played 57 games at second base, 25 games in the outfield & 19 games at third base. He made appearances in 122 games total, batting .240 with 8 HRs 14 doubles & 53 RBIs. 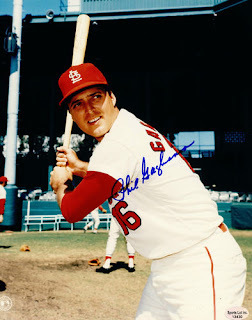 He got to play in three World Series with the Cardinals in the sixties, winning two Championships in 1964 & 1967. In the 1964 season he hit .259 in 40 games without getting a chance to play in the World Series. In 1967 he hit two HRs with 21 RBIs batting .221 playing in 73 games. In the World Series against the Boston Red Sox, he got one at bat going hitless. The next year he was used mostly as a pinch hitter, playing a utility role in the infield & outfield batting .229 with 12 RBIs. He got three at bats in that World Series against the Detroit Tigers, again going hitless. 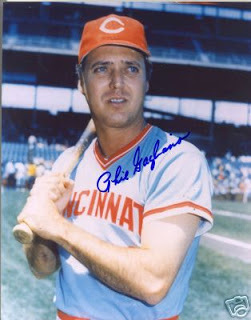 Gagliano was traded to the Chicago Cubs during the 1970 season, playing in just 26 games. In December of 1970 he was traded to the Boston Red Sox for Carmen Fanzone, where he became one of the league's best pinch hitters. Gagliano hit .354 as a pinch hitter in 1971 with a .413 on base %. In the spring of 1973 he was sent to the Cincinnati Reds with Andy Kosco for Mel Behney. As a pinch hitter for the 1973 NL Western Champion Big Red Machine, Gagliano hit .366, one of the league's best pinch hit averages. Overall he batted .290 with a .402 on base % contributing to the team as he filled in a few games behind Joe Morgan & Dennis Menke. Post Season: He got to see action in three Games of the 1973 NLCS against the New York Mets, going 0-3. First he struck out in the 5th inning of Jon Matlack’s Game #2 two hitter in Cincinnati. He made the last out off Jerry Koosman in the classic Game #3, the game where Bud Harrelson & Pete Rose had their famous brawl at Shea Stadium. He also grounded out in the next game as a pinch hitter. He retired the next season. Gagliano finished his 12 year career with a .238 batting average with 336 hits 14 HRs 50 doubles 159 RBIs & a .316 on base % in 702 games.